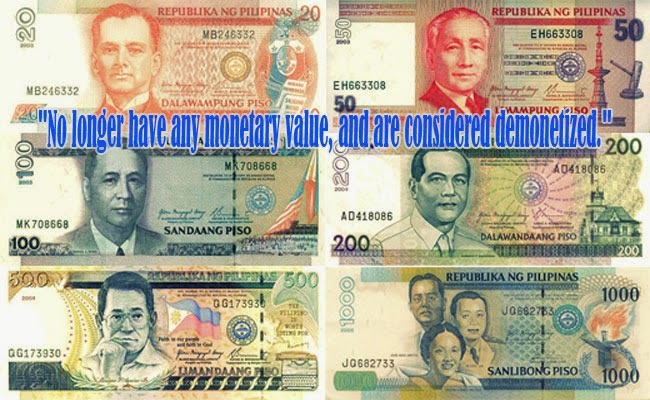 Banko Sentral ng Pilipinas said that the old bank notes will be withdrawn from from the circulation starting on January 1, 2015 until December 2015. The old bank notes are used since 1985 and the new bank notes had been circulating for a while, however it had only been recently that BSP ha announced that it will be withdrawn. Diwa C. Guinigundo, BSP Deputy Governor, shared that demonetization starts on January first until December 31st of 2015. For the year of 2015, the public can still use the old banks notes but they are encouraged to changed them within the year. According to ABSCBN news, by January 1, 2016, the old bank notes will no longer be accepted for paying services and buying goods. Though the old ones will not be accepted for services, goods and others, they can still be changed in banks until the end of the year 2016. The new generation of banks notes can be exchanged in banks and other BSP offices and branches all over the country. For those who are in other countries and have the older version of bank notes but unable to change them within the given time frame are encouraged to register in BSP’s website. This gives them an opportunity to change the banks notes in BSP offices and branches a year after the registration. A special exchange arrangement can be done if there are banknotes held in some government institutions used for cases. By 2017, the old generation of bank notes will be considered of no monetary value and demonetized. As of date, there are 729 million pieces of the said older generation of bank notes circulating and it is worth P192 billion.. The demonetization is done in accordance with aiming to secure the integrity of the country’s bank note and secure them from counterfeit and for the alignment with other countries who change their bank notes every 10 years. The older generation of bank notes was last printed in 2013 while the new generation was circulated since 2010.